From Fortune 500 companies to small mom and pop convenience stores, every Northern Virginia business has two goals in common: profitability and security. First and foremost, every business is out to turn a profit. Period. End of story. Secondly, every business must protect its assets. So how do you ensure your business is well-protected against theft and burglary? Commercial Fence Installation. While security alarms and surveillance cameras are retroactive forms of security, a commercial fence in a proactive way to keep your facility safe. A fence sets a perimeter around your property, making it much more difficult for any unwanted visitors to access your building. Hercules Fence has experience in nearly every type of commercial fence installation: galvanized and vinyl coated chain link, PVC vinyl, ornamental steel, temporary fencing, wood and ornamental aluminum. Hercules can customize and install a fencing design to fit your project. We have the know-how to tackle your commercial fence installation. When you call today, a trained commercial salesperson will listen to your wants and needs and explain what product is right for you and your business. A new commercial fence can improve the curb appeal of their facility, which can help you attract and retain customers. Whether you need to protect the privacy of your clients or keep prying eyes away from your work, commercial fencing can do the trick. 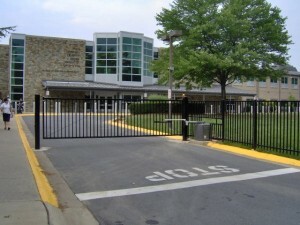 Commercial fencing is a cost-effective way to boost the security of your facility. If you have any questions about Commercial Fence Installation in Northern Virginia, you can contact Hercules Fence today by calling (757) 316-3600 or visit FencesNewportNews.com today! You can also follow Hercules Fence on Facebook, Twitter, Google+ and YouTube. This entry was posted on Tuesday, March 11th, 2014 at 6:49 pm. Both comments and pings are currently closed.